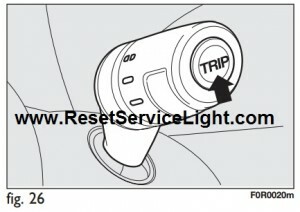 Reset trip computer Fiat Linea. Manufactured in 2007 – present. Trip computer general features Fiat Linea. The “Trip computer” is used to display information on car operation when the key is turned to MAR. This function allows to define two separate trips called “Trip A” and “Trip B” for monitoring the car’s “complete mission” in a reciprocally independent manner. Both functions are resettable (reset – start of new mission). “Trip B” functions may be excluded (see “Trip B on”). “Range” and “Instantaneous consumption” cannot be reset. range shorter than 50 km (or 30 mi). This indicates the distance covered from the start of the new mission. This indicates the average consumption from the start of the new mission. if the car is parked with the engine running. This shows the car average speed as a function of the overall time elapsed since the start of the new mission. IMPORTANT If information is not available, the message “—-” will appear instead of the Trip Computer values. Displaying of the values will be resumed when normal operation is restored without resetting the values displayed before the problem nor starting a new mission. briefly press to display the different values. hold pressed to reset and then start a new mission. Start of journey procedure Fiat Linea. 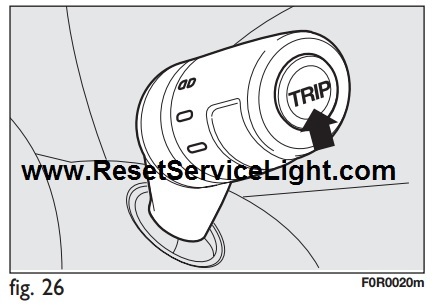 All information how to reset trip computer is taken from Fiat Linea owners manual.